Fabric Origami - The Prettiest Ornaments On the Tree! Origami, the art of folding paper into fanciful shapes, takes on a whole new dimension when it's done with fabric instead of the tissue paper that's traditionally used. The silk fabrics that I like to use for origami Christmas ornaments have rich colors and a luscious sheen that looks wonderful when paired with all sorts of sparkly beads, buttons, and bangles. I love mixing things up, choosing different patterns, colors, and embellishments for each piece. I sort through jars of vintage buttons until I find the perfect ones for a particular ornament. I make the ornament hangers by twisting 20 gauge wire into spirals, squares, and hearts, adding beads and buttons to coordinate with the fabric colors. The origami patterns come from the book Flower Origami by Kumiko Sudo. It's a good primer for learning the folding techniques. All of these ornaments are available for purchase at Artbeat Gallery in Waynesburg, PA. In a few days I'll be posting instructions for making one of the designs you see here. So gather up some pretty fabrics, get out grandma's old button jar and get ready to create some beautiful handmade gifts for a few people who are lucky enough to know someone as crafty as you! For several years I've been printing and sending greeting cards featuring prints of some of my favorite floral watercolors. People enjoyed them so much that they began asking to buy them as gifts. Now they're available at Artbeat Gallery in Waynesburg, PA. 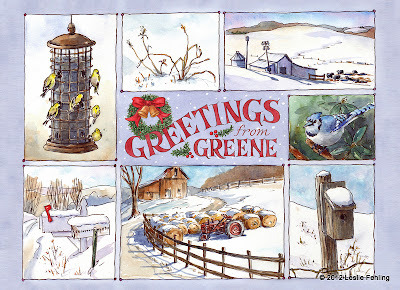 In the Greene County series, I've included both town and country scenes in all seasons of the year. The floral series showcases some of my favorite flower sketches. If you're in the area, I hope you'll stop by Artbeat and take a look. It's a great place to start your holiday shopping. They've got a wonderful selection of gorgeous handmade items that you won't find anyplace else. 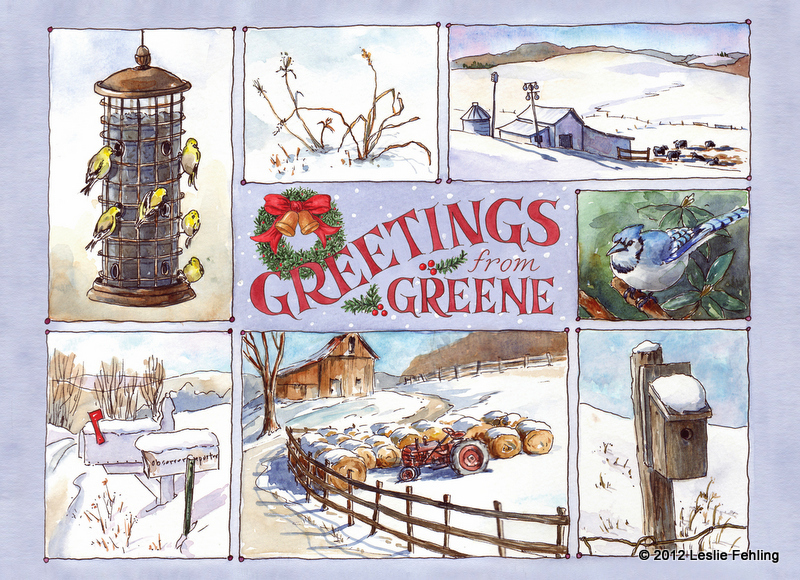 And, speaking of cards....the Christmas cards I designed last year for Greene County Tourism are once again on sale at the tourism offices at 19 S. Washington Street in Waynesburg. When my 2-1/2 year old grandson, Nicholas, graduated to a toddler bed a few months ago, his mom and I began planning a new quilt to replace the puppy quilt I had made for him when he was a baby. 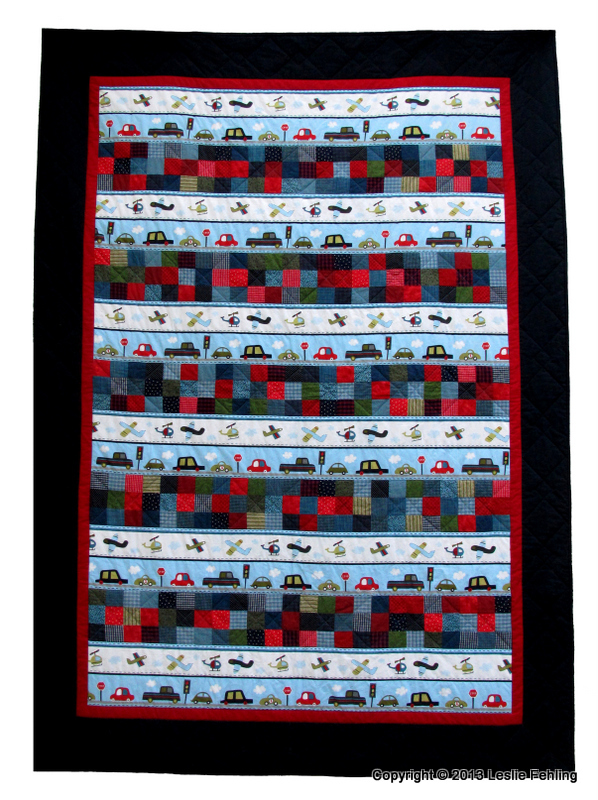 Nicholas, like most little boys, loves cars, trucks, and anything else that has wheels and makes lots of noise, so we knew he would love a transportation themed quilt. We found the Kaufman "Vroom Vehicle" fabric online and decided to build the quilt design around the cute striped fabric that's the centerpiece of the "Vroom" collection. The banded quilt layout worked great to show off the 8" wide stripes of the vehicle fabric. I set off the pre-printed strips with patchwork bands of 2-1/4" (finished size) squares pieced together randomly. My mom (great-grandma Saundra) and I did the piecing, then I set to work quilting it. The machine quilting was kept simple, with just enough stitching to hold everything together nicely. At the last minute, we decided to add a pillow sham to match the quilt. So cute! I hope this quilt gets played on, dragged around, danced upon, cried with, snuggled under, and loved to pieces. And I hope Nicholas will always know just how much his mommy, grandma, and great-grandma love him.